With eight races scheduled day one started in 7 knots from the NW and a tight dual between Sean Wallis W.A. Ben Lamb N.S.W. and Simon Grain Victoria ensured with Sean Wallis holding a tight finishing fleet. Heat 2 Saw David Suda from Victoria leading but Vladimir Borstnar from Singapore sailed deeper angles downwind to take heat 2 from Suda and Wallis. Day 2 was sailed in 12 kts of steadier breeze and heat 3 saw Ben lamb lead from Alyn Stevenson S.A. with Wallis 3rd. Wallis worked his way to the lead to win the heat from Lamb and Stevenson. Race 4 proved to be costly for David Suda who was OCS and Wallis again sailed extremely fast up the first beat to lead from Lamb with Borstnar third. Heat 5 saw David Suda from Victoria again mixing it with Wallis and Lamb and the trio led the Singapore team around the first leg. Wallis was just too quick and went on to win another heat from Suda and Borstnar. Day 3 and the weather looked ominous. 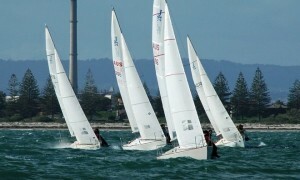 The Race committee boat blew a turbo so racing was postponed whilst another committee boat was prepared. The Race committee kept a close eye on the rain bands to the west expecting some turbulent weather. With only five races sailed David Suda was hoping for at least two races so he could drop his OCS. After a 90 minute postponement the fleet made its way to the start in 22knts of breeze. Heat 6 Wallis was just too quick and bolted to lead the fleet around the course with Suda second and Lamb third. Heat 7 started ok but a 35 knot rain squall came through half way up the first beat reducing visibility to zero, hence the Race committee abandoned all further racing. 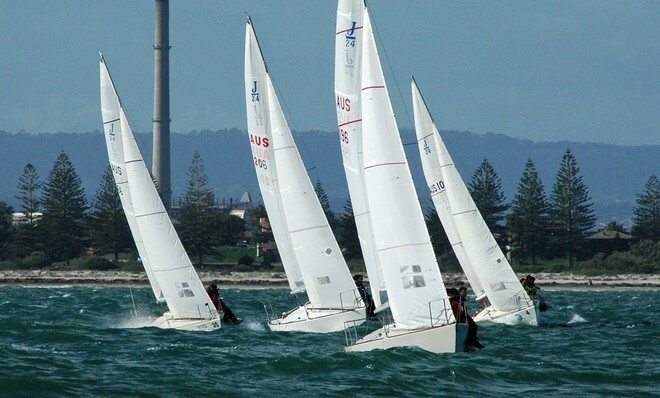 The Regatta has some extremely close racing and all competitors were thrilled the standard of competition vowing to return next year with the fleet expected to swell to 30 entries.